I’m not sure if I can think of another case where a game’s title so effectively conveys its subject matter. It could refer to the decaying undead hordes that shuffle around the map, or the fact that nearly every aspect of the community which you must try and ensure the survival of deteriorates over time. Perhaps it is referring to my mental state, which seemed to degrade as I continued playing, becoming more and more anxious as the needs of my growing community seemed to increase in an inverse relationship to the ease with which I could meet them. Yes, State of Decay has returned, and once again in the form of a zombie survival sandbox that puts the emphasis squarely on overseeing the continued well-being of a group of survivors over zombie-slaying or the power fantasy of any individual character. The sequel starts out the same way as its predecessor, with a brief scripted tutorial that introduces you to your starting characters (of which you have several choices) and the basics of the game. Before long, you must choose between one of the three available areas as a location to start your community, with each area representing a unique, sizeable map in what appears to be American suburbia. Once you get your group of survivors settled into a safe-house, a bunch of stats delineating the amount of different resources you have alongside the morale of your group appears on screen, and the real game begins. As with State of Decay 1, managing the well-being of your community represents the core of the experience, and everything you accomplish will be in service of ensuring the survival of the collective group. If the character you are playing as dies, rather than reload a previous save, you simply take over a different character from the remaining survivors. Everything you do is permanent, which adds a significant layer of tension. Each survivor has specific skills, such as medicine or gardening, and these can prove critical to your group’s endurance, and losing just one person can be a major setback if it happens at the wrong moment. The most important and most common thing you will need to worry about is having enough resources. A large part of State of Decay 2 is comprised of going on scavenging runs and looking for rucksacks filled with food, fuel, ammunition, medical supplies or building materials. These are the basic resources stored at your base, and some of them are used up constantly, especially food and medical supplies. At the start of each campaign, you can search the buildings surrounding your base and find what you need pretty easily for your small group of survivors. There is even a risk/reward mechanic when it comes to searching containers for supplies, as you can search slowly without making noise, or search quickly and risk causing a ruckus that might attract some unwanted attention. Once you clean out the areas immediately surrounding your base and start taking in new survivors who you find out in the world, securing enough resources becomes increasingly difficult. Each character can carry one rucksack of supplies at a time, meaning you will need to use vehicles so you can load supplies into the back and cover longer distances on the increasingly dangerous and difficult scavenging runs. Vehicle handling is very bouncy and arcadey, and using cars as a weapon against zombies is encouraged as you can open your car door while driving past to eviscerate them without damaging the vehicle, or even upgrade the vehicle to make more direct hits a more sustainable method. Vehicles are prone to get stuck on objects like rocks or railings and bug out, which can be frustrating since they can be somewhat rare and you risk losing them permanently if you get them truly stuck. Fuel and repair kits are further resources required to keep your car running, and their engines also make noise which attracts zombies, meaning using them isn’t without downsides. Another thing you must keep an eye on is the zombie blood plague, contracted to your survivors by certain infected zombies that have red glowing eyes. You can build a medical clinic to cure and look after those who become infected with it, but otherwise survivors who contract blood plague are doomed to become zombies themselves. To get rid of plague zombies, you must deal with plague hearts which is a challenging task where you destroy a tough disease-spewing blob while fighting off waves of plague zombies. One long-term objective is to clear the town of plague hearts to stop plague zombies from appearing, with each successive heart seemingly getting harder to kill. When it comes to fighting, the mechanics are simple but fairly satisfying. You can use melee weapons or firearms, with a basic stamina system where attacking and dodging use stamina governs the melee. Zombie heads pop like watermelons, and you can perform a finishing move on knocked-down undead, and unlock a couple of special moves such as a drop-kick for survivors who are experienced in melee combat. Firearms are similarly straightforward, with no way to aim down sights, and only a basic zoom-in capability for scoped weapons. There is a good variety of firearms and melee weapons but most of them handle in very similar ways. There are even basic stealth mechanics, letting you sneak around and do takedowns from behind zombies, or use silenced weapons to avoid attracting unwanted hordes. This is useful when clearing zombie infestations, structures that get particularly overrun with the undead and lower morale in your community. Most infestations have screamer zombies that will let out a terrible shriek and cause others nearby to come running, so sneaking around until the screamers have been killed is encouraged. Other special zombie types return from State of Decay 1, including bloaters who explode in poisonous gas clouds, fast and viscous volatile zombies, and giant hulking beasts who I tended to avoid. Though the combat is fairly simplistic, incredible tension can still arise when you find yourself in a bad situation. One time I was out doing a simple errand with one of my most well equipped and experienced survivors who I hoped would eventually become the leader of the group. It was dark when returning to my base, and I drove off a small cliff just a hundred meters from my main base. My car got stuck and I got out, only to find myself fighting a volatile zombie alongside a large horde of normal ones. My character was suffering from fatigue and was also over-burdened with gear, and I ended up losing him within sight of my home base. These kinds of thrilling and terrifying moments arise organically and with enough frequency to make the more mundane aspects of keeping your community alive more meaningful with the possibility of things going terribly wrong always lurking around the corner. If you aren’t busy enough with supply runs, clearing infestations and destroying plague hearts, you will also need to worry about completing missions for survivors in your group, or for other groups of survivors. The missions themselves are usually pretty straightforward; you might help another survivor go on a looting run, or help another group construct something in their base like a Still so that you can have access its benefits without building one yourself. These missions can be ignored, but other groups can turn hostile if you ignore them for long enough, and fighting bandits can be dangerous. Managing your community, home base and outposts also requires some attention. Your starting base will be relatively small, with only a handful of beds and a few slots for constructing facilities. These range from medical depos and a workbench to let you craft special items like bombs and ammunition, to gardens and farms that let you grow food or healing herbs, to watch towers that improve your base's defensive prospects. Once your community grows enough, you will need to find outposts which let you access your supplies remotely, and also provide bonuses like some extra beds or food collection. 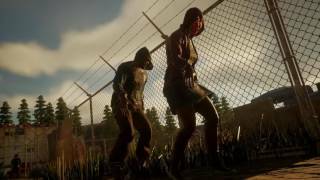 If your community gets big enough, you may even need to move your main base to a larger facility, which will require a large chunk of influence, the currency in State of Decay 2 you get from trading with other groups, completing missions and killing special zombies. Much of the above will sound familiar to anyone who played State of Decay 1, and the sequel definitely follows closely in the design footprints of its predecessor. One new feature is co-operative play for up to four players, which can be done a couple of ways. You have a radio in-game which can be used to locate resources, or to call for help. You can call for help to match-make a random person into your game, or volunteer yourself to go into another person’s, a bit like summoning in Dark Souls. You can also just join friend’s games via the Xbox interface in a more typical fashion, though having your game always open to be joined by friends means you cannot pause even when playing alone. The game allows for cross-platform play between PC and Xbox, and is a Play Anywhere title so you can play on either platform with a single copy on the same account. Co-op integration is otherwise fairly smooth, though you will need to bring one of your own survivors into co-op sessions and risk them getting killed or injured. You can bring back any items you find while scavenging in another person’s game into your own, but not major resources like rucksacks of food or medical supplies which you must donate to the host's community. When scavenging, resource containers are color-coded, meaning each player can only search containers highlighted with a color that corresponds to them. This system works well enough, providing a chance for the person joining to get some basic supplies like weapons and ammo without having time move forward in their own game, while the host gets an extra set of hands to help kill zombies and bring resources back to their base. One aspect of State of Decay 1 that does unfortunately return here is an overall lack of polish. Minor glitches such as doors that already look open needing to be opened again, seeing zombies spawning ten feet off the ground or getting stuck running into buildings are the most common. In co-op as a visitor, I found some objects in the host's world were invisible to me, and some weird flickering when both myself and the host were using flashlights. I got stuck in between rocks a couple of times, but there is a ‘I’m stuck’ button that will back-track your character a small amount that helped me in these cases. Another time, my controls stopped working correctly, requiring a restart of the game. None of the issues I encountered were game breaking, and given this is a budget systems-driven open world game these kinds of quirks aren’t surprising, but a bit more time polishing the game likely would have gone a long way here. Fortunately things seem to fare better from an optimization standpoint as the game ran well for me and I didn’t experience any crashes. Visually the game appears a bit better technically than its predecessor, though it’s not exactly a looker with a somewhat muted color palette and heavy recycling of assets between the three available maps. It definitely looks like a budget game. Night time is extremely dark, which ratchets up tension when going out with your feeble flashlight barely able to cut through the inky blackness. 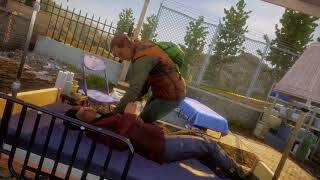 You will need to get used to dealing with this as the day/night cycle is quite lengthy and with so much time pressure you will want to be going out on missions and scavenging runs around the clock, switching between different survivors to give those who are fatigued and injured a chance to recover. Audio is decent enough overall, with different zombies making different sounds, and firearms and melee-weapons having suitably squishy audio effects when making contact with an undead skull. Vehicles sound a bit weak and overall ambient audio can sometimes be lacking, especially since the sparse, low-key guitar driven soundtrack leaves plenty of silent gaps without much to fill them, aside from radio calls and chatter between survivors which is voiced and written well enough. If you played the original State of Decay, your feelings about that game will likely transfer to this one as well. I found the overall experience a bit easier to fully grasp and the interface design to be significantly friendlier this time around, with full co-op support being an excellent addition. Some rough edges and occasionally tedious and repetitive gameplay that can crop up during less eventful excursions are issues that return from the first game, and will likely be noticed more by some than others. If helping a group of survivors flourish in a zombie apocalypse by means of careful planning and management instead of brute force sounds like an appealing prospect, State of Decay 2 is well worth a look. 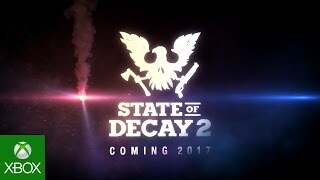 State of Decay 2 looks fine but unremarkable with a muted color palette and not much in the way of unique art direction. Audio design is solid aside from weak sounding car engines, the mostly low key original score works well enough. Moment to moment gameplay mechanics are simple but satisfying and often tense due to perma-death, managing the needs of a community with plenty of ticking clocks and potential problems proves quite compelling. Lots of randomization and three different maps make each communities' journey a bit different allowing for significant replay value, AI companions function fairly well when playing solo. Co-op is smoothly integrated as you can drop into and out of friend’s games at any time, or use an in game radio to matchmake random players into your game. The game ran smoothly for me, though I did experience plenty of minor bugs and glitches as well as once instance where the controls stopped working properly. Smoothness of online play seems to depend on a good connection between players.